There is a large parking lot across from the church on Heathcote Road, and a smaller parking lot behind the Sanctuary (a total of 110 spaces). You can also park on the southbound side of Heathcote Rd by the Parish House. Take the Bee Line #40 or #41 bus to the stop closest to the 5-way intersection of Post Road (also known as Route 22 or White Plains Post Road), Heathcote Road, Drake Road and Crane Road. Click here for bus information. You will see the sign for the church at the intersection of Post Road and Heathcote Road. Walk up Heathcote Road to the Sanctuary. • Cross the street (East Parkway) and turn left (north) toward the Chateaux apartment complex. • At Crane Road turn right. 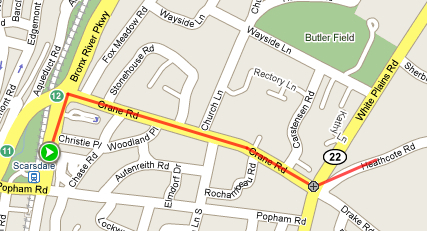 • Walk up Crane Road all the way to the major intersection with Post Road (aka Route 22 or White Plains/Post Rd). • Cross Post Rd. You'll see the sign for the Scarsdale Congregational Church at the intersection of Post Rd. and Heathcote Rd. • Turn left to walk up Heathcote Road to the sanctuary.